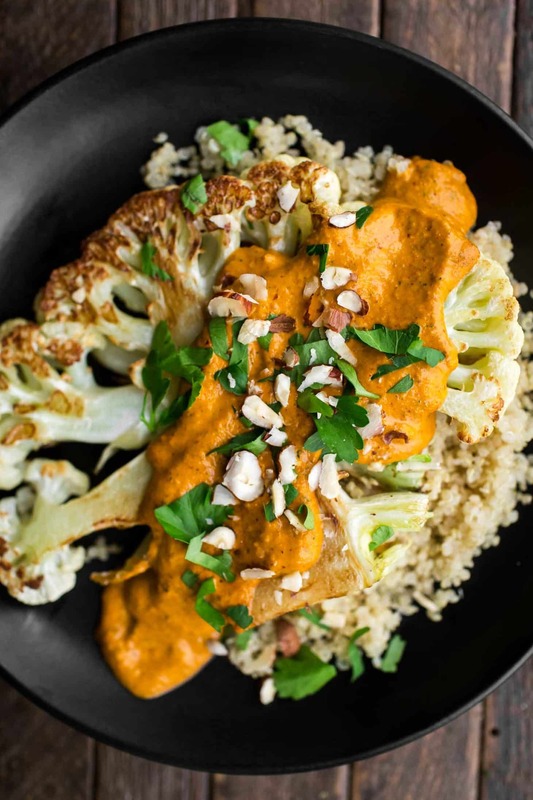 Fried Cauliflower with Romesco Sauce and Quinoa | Naturally. There are three kitchen tools I will always have: a good chefs knife, my flour grinder, and my high speed blender. Everything else I could do without (I’ve even learned my stand-mixer is a nice-to-have). With these three things, I can do pretty much anything I could ever want. You might balk at the flour grinder but once you start grinding your own flour- you won’t go back. And the blender? It’s booted my food processor off the counter. This fried cauliflower is made because of the romesco sauce. If you’ve never tried this sauce before, I cannot recommend it enough. A few toasted nuts are combined with roasted red pepper, herbs, and spices to form a powerful sauce (and the reason for mentioning the blender!) You could also make the sauce in a mortar and pestle but I love the creaminess the blender lends. 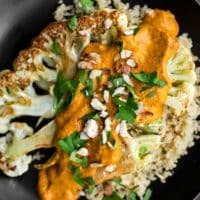 A perfect vegetarian fork-and-knife dinner with a tender fried cauliflower slice smothered with homemade romesco sauce. Rinse quinoa and place in a medium pot with broth, water, and salt. Bring to a boil, reduce to a simmer, cover, and cook for 12 minutes. Remove from heat and let sit until ready to serve. While the quinoa is cooking, remove the greens from the cauliflower and cut right in half. Slice a ½” thick slice of cauliflower from each half. Set aside remaining cauliflower for another use. Heat a skillet over medium-low. Add olive oil in a skillet large enough to hold both cauliflower slices, or work in batches. Add cauliflower slices to the heated oil and fry on each side until golden, 4 to 5 minutes on each side. Sprinkle with salt and pepper and transfer to a plate. In a small, dry skillet, add the almonds and hazelnut pieces over medium heat. Shaking the skillet often, lightly toast the nuts until fragrant, 4 to 5 minutes. Serve the fried cauliflower over quinoa and spoon romesco on top. Tips and Tricks: You most likely will have leftover romesco sauce. Use it in this romesco potato pizza or romesco green beans. Nutrition: See the information (this includes the quinoa + using all the sauce). There is really nothing quite like slicing and frying cauliflower. I’ve made similar ‘steaks’ from celeriac and fennel before but the flavor of each is more pronounced. Broccoli would work in place of the cauliflower, I just find cutting the heads of broccoli to be a bit more of a pain. Roast/Grill: I know not everyone reading this will want to fry the cauliflower. That’s fine- there are other ways! I like to lightly steam the cauliflower then grill in a pan. You could also roast the cauliflower until tender. Grains/Salads: I like using quinoa because of the protein boost but you could use any grain you have on hand. Amaranth is also quick cooking/complete protein like quinoa. Romesco: Switch up the romesco by using a green variation. This dish looks wonderful and I must try this sometime. Which high-speed blender are you using and why is it preferred over a food processor? I’m looking to boot my subpar blender and invest in a food processor so I can have the option to grind up dry items, perhaps there is such a blender that can do this?? Hi Kim- I use a Blendtec. I’ve had it for 4 years and it’s my workhorse. I can go from grinding flour to making the smoothest hummus. I know Vitamix also makes a great machine but I can’t speak for that. I think the blender is a bit more versatile than a food processor. What kind of dry items are you looking to grind? Hello Erin! Thank you for sharing, I just did a bit of research and Blendtec sounds fantastic. Dry hard foods I want to grind are nuts and sweet potatoes, but really I want to pulse/blend/chop everything under the sun! I’ve just starting transitioning into a high plant-based diet and I never found the need for a food processor until now, it allows for so much creativity and variety! I’m usually with you- 90% of the time I roast cauliflower. This method is a bit faster and I like the sear on the cauliflower. Browning from roasting just isn’t quite the same. This sounds absolutely wonderful. I’ve been craving to eat lighter lately, so I hope I’ll be able to make it soon. 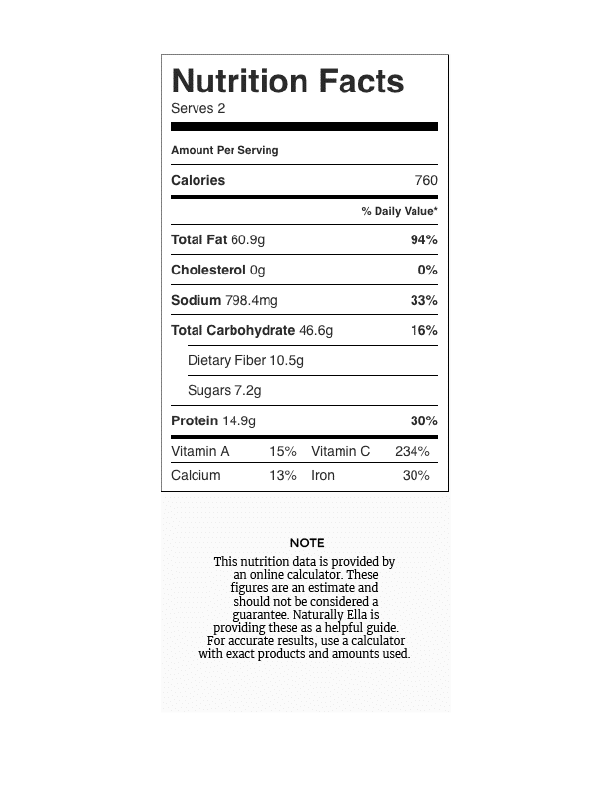 Just wondering – is the calorie count of 760 for 2 servings or 1? 1 but that’s also accounting for half the sauce. Most likely the calories would be quite a bit less because there’s a good chance you wouldn’t use all the sauce. 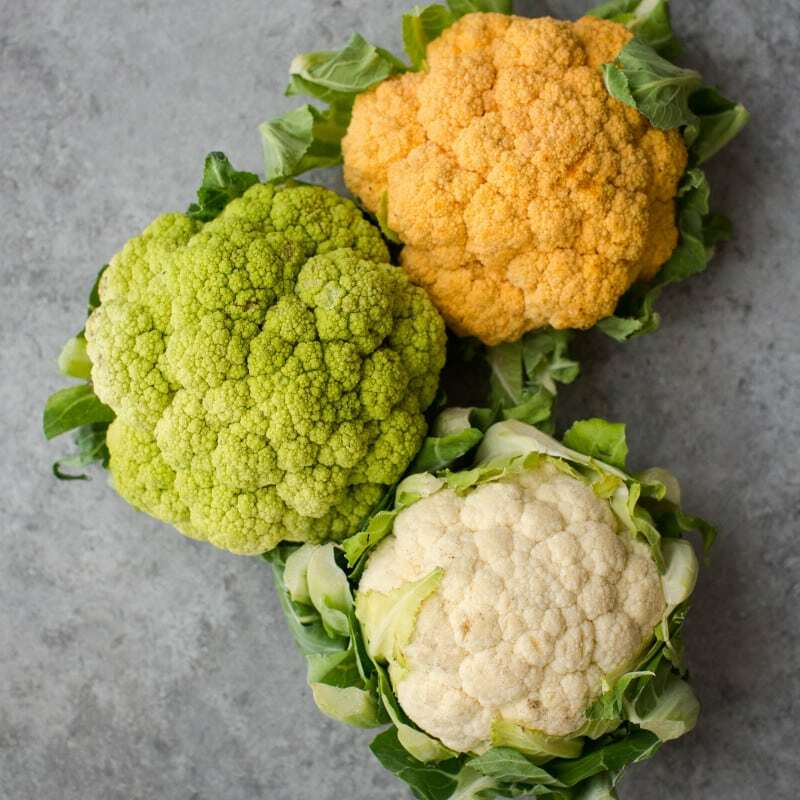 Hey, i love anything with cauliflower combo and this one is really worth to try as it looks sooooo delicious, hope my kids enjoys the taste.